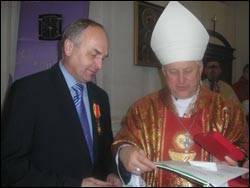 Berdychiv – On 4 December 2007, at St. Barbara’s Church in Berdychiv, Bishop Stanislav (Shyrokoradiuk) read a decree of the Roman Hierarch, according to which Pope Benedict XVI awarded Berdychiv Mayor Vasyl Mazur the Noble Order of St. George the Great of I Degree. RISU's Ukrainian-language webpage posted the story. The ceremony took place during a celebration of the local Roman Catholic community, in which 14 priests and faithful participated. RISU’s correspondent Viktor Makovskyi reported the story.